Laying the groundwork for a well-structured Google Shopping campaign takes time. Creating a granular ad group structure that corresponds well with your product feed structure is absolutely essential to set your Shopping Campaigns up for success. However, I’ll often encounter accounts that have Shopping Campaigns run on autopilot after the initial set up has been completed. Below are three optimizations you should be making on a routine basis to make sure your Shopping Campaigns are still structured in a way that allows you to maximize revenue while hitting your account goals. One of the most exciting changes accompanying the migration to the Google Shopping format was the new insight available into competitive metrics–Benchmark CTR, Benchmark Max. CPC, & Search Impression Share. But unless you’re actively including those metrics in your bid management strategy, those competitive insights go to waste. 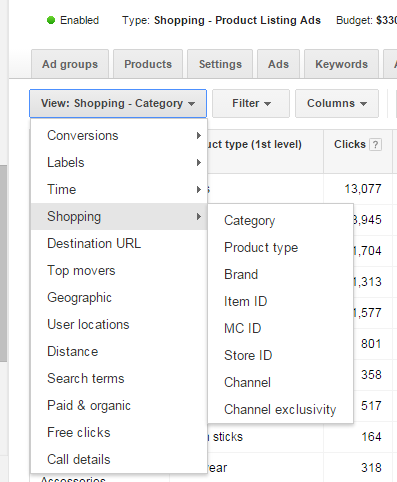 Below is an example of how this data provides a road map to optimizing your Google Shopping campaign. This particular client is looking to maximize revenue at a minimum ROI of 7. For our cover lifts product group, we see a phenomenal ROI of 10. Previously with PLA campaigns, that’s where our visibility would have ended. But with competitive metrics, we can see we have only 57% Impression Share for all eligible cover lifts auctions and our bid of $1.07 is well below the Benchmark Max. CPC of $2.54. Those competitive insights alone would not necessarily be enough for us to increase bids here, but combined with our 10 ROI well above our minimum, this is a clear growth opportunity for us to crank up bids to maximize visibility & revenue here. **Note that these competitive metrics go away should you choose to segregate your campaign by Product ID. So while that level of granularity might make sense if you’re trying to set product specific bids or exclusions for particular products, keep in mind that you’ll lose the valuable insight gained from these competitive metrics. In the below example, we see that the product type “Philips Respironics CPAP Machine” has generated a significant number of conversions and spent just over $200. Regardless of whether the product type ROI of 2.4 is above or below the account’s ROI goal, this is absolutely a product that we would want to break out into its own independent product target to allow it to be bid up or down based on performance. Similar to checking the Dimensions>Search Terms report for your search & shopping campaigns, checking the Dimensions>Shopping report should be a regular part of your account optimization routine. Settings changes might seem like a no-brainer, but often campaign-level settings are more neglected in an account than one might think. Taking a step back to paid search basics can help you find some quick wins for boosting campaign performance. Check in with Mobile performance, geographic performance by state, hour of day, or day of week performance to see if you can identify strong performing areas to increase bids or poor performing areas to pull back spend. Let’s take a look at one Shopping Campaign’s device settings as an example. This is a client that’s very focused on efficiency and is looking to improve their account-wide ROI. We see a Shopping Campaign with a poorer Mobile ROI where it makes sense to significantly decrease our mobile bids. Keep in mind, these settings adjustments should not be a one-and-done effort. Routinely checking back in on the settings adjustments you’ve made to evaluate whether they need to be readjusted is absolutely vital in maintaining & improving on strong account performance. There are endless ways to continue to optimize your Shopping campaigns that will vary based on account goals & circumstances, but these elementary steps should be a part of account management strategy. You’ve taken the time to develop a product feed & create Shopping Campaigns. Why not go the extra mile to continuously improve your Shopping Campaign’s performance?